The Ides of March Shoot at the Eustis Gun Club (EGC) begins at 9:30am on Saturday March 21st. Over 300 shooters are expected to compete. Eustis requires visitors to sign a liability release to be on the premises. Click HERE to get the release form. Please sign the form and bring it with you to the Cowboy shoot. Review the EGC range rules HERE. Cowboy Action Shooting also known as Western Action Shooting, Single Action Shooting, or Cowboy 3-gun, is a competitive shooting sport that originated in Southern California, in the early 1980s. Cowboy action shooting is now practiced in many places with several sanctioning organizations including the Single Action Shooting Society (SASS), Western Action Shootists Association (WASA), and National Congress of Old West Shooters (NCOWS), as well as others in the USA and in other countries. CAS is a type of 3-gun match utilizing a combination of pistol(s), rifle, and/or shotgun in a variety of "old west themed" courses of fire for time and accuracy. Participants must dress in appropriate theme or era "costume" as well as use gear and accessories as mandated by the respective sanctioning group rules. Competitors are typically required to use firearms typical of the mid-to-late 19th century: single-action revolvers, lever action rifles chambered in pistol calibers, and side-by-side double barrel shotguns (also referred to as Coach Guns – with or without external hammers, although automatic ejectors are not allowed), or pump-action shotguns with external hammers (similar to the Winchester 1897). Winchester 1887 lever-action shotguns and Colt Lightning slide-action rifles are also allowed in competition. Both original and reproduction guns are equally acceptable. All handguns must be "single action", meaning that the hammer must be manually cocked before each shot can be fired. 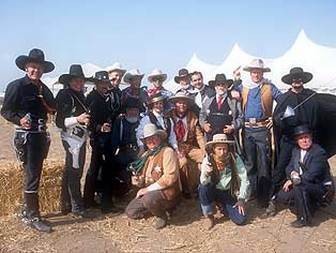 Competitors are required to wear an Old West or Victorian era style outfit and apparel. One exception to this is that safety glasses and hearing protection must be worn when shooting. Depending on the standards of the sanctioning organization, clothing may be historically accurate for the late 19th century or may just be suggestive of the Old West. 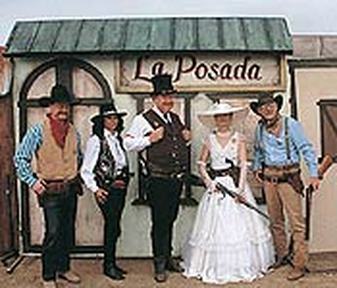 Some groups allow for costume similar to that worn by characters in a western B-movie, such as Hopalong Cassidy or a television series like Gunsmoke. In SASS-sponsored Wild Bunch shooting, the required dress is military clothing of the early 20th century, Western clothing typical of that time (such as that worn in the filmThe Wild Bunch) or Mexican period dress.